Full Tilt Poker is home to more well-known poker pros than any other poker site in the world. If you’re lucky (or unlucky, depending on how you look at it) you’ll run into names like Phil Ivey, Howard Lederer and Mike Matusow. If playing against big name professionals isn’t your idea of fun, that’s OK too because Full Tilt always has thousands of tables up and running. Full Tilt is the second largest online poker site in the world, and offers unique features including "Rush Poker" and "Cashout Tournaments". The enormous player volume is great for anyone who wants to play anything other than No Limit Hold'em, because there is massive player traffic for every game. Plus, when you sign up from BestPokerSites.org you will receive a special 100% up to $600 bonus on your first deposit. Overall, Full Tilt Poker is one of our most highly recommended online poker sites. The large player base, rock solid software and big deposit bonus make it a pleasure to play at Full Tilt. I don’t want to sound like I’m trying to oversell Full Tilt but it really is one of the best poker sites around. Full Tilt didn’t become the second largest poker site on the planet by accident. All players who sign up through this site will receive a 100% deposit bonus for up to $600 extra. This bonus is a dollar for dollar match and will double your first deposit at Full Tilt. If you deposit $200, for example, you’ll get an extra $200 in bonus cash. This bonus only applies to your first deposit at the site so make sure you make your first deposit count. After you make your deposit at Full Tilt, the bonus money is held in a pending account until you clear it. The bonus money is then released as you earn Full Tilt Points by playing in real money poker games at Full Tilt. Every Full Tilt Point is worth $0.06, and every time you clear $20 worth of bonus money, that money is released to your real money account. This process continues until the entire bonus has been cleared. Also, check out this blog post to learn how to earn Full Tilt Points or read our Full Tilt Poker bonus guide. One of the most impressive new software features is “Rush Poker.” It’s just like playing in normal ring games except every time you fold your hand, you are instantly dealt in to a new hand at a new table. The software is always shuffling players around so that every time you fold, there’s a new hand beginning somewhere. This completely eliminates those boring waiting periods between hands and significantly increases the number of hands you see per hour. The Full Tilt tournament selection is massive and comes second only to PokerStars. Every Sunday is the Sunday $750K Guarantee with a prize pool that is never less than $750,000. The first place prize for this tournament is considerable but the entry fee costs only $216. Players can also win their way in through satellites that cost as little as $2.25. The rest of the week is full of a wide variety of tournaments as well. The $10K Daily Dollar features a $10,000 prize pool and costs just $1.00 to enter. It’s a great deal but that’s just one example of hundreds that run every week. The tournament scene at Full Tilt has really picked up steam in recent months and may soon overtake even PokerStars. Available tournament types at Full Tilt Poker include traditional freezeouts, satellites, rebuys, guarantees and freerolls. These tournaments come in all buyins, ranging from $0.10 to $1,000 or more. Sit-n-go tournaments are also popular and those have just as wide a range of buyins as well. 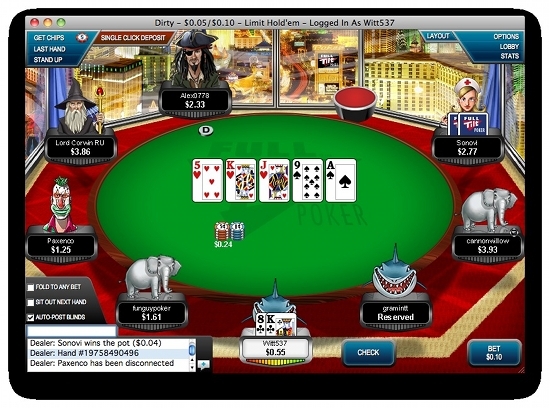 Full Tilt Poker long ago reached status as one of the web’s most populated poker rooms. With roughly 100,000 players logged in around the clock, finding a game is never a problem. It can be 2:00 PM on a Monday afternoon or 4:00 AM on a Wednesday morning and you’ll still find thousands of tables up and running. The skill of the opposition is dependent upon the stakes. The micro stakes games are loose and easy to beat but the skill level increases as you move up in stakes. Middle stakes cash games have gotten a little tighter over recent years but the large table selection makes it possible to find soft games to this day. When you’re ready to try your luck at Full Tilt, there are several deposit options to choose from. Withdrawals are always processed quickly by Full Tilt Poker. The best current withdrawal method is a simple paper check, but players can also elect to receive bank wires or premium bank wires which show up a little quicker. If players deposited with an eWallet you can always withdraw back to your eWallet. Customer support is surprisingly lacking considering the size and success of Full Tilt Poker. The biggest problem is that they only offer e-mail support. There’s not a single phone number or live chat link to be found on the Full Tilt Poker website. The good news is that their e-mail support team responds quickly to e-mails and will call you by phone if they need to speak to you in real time. Ready to Play? Visit Full Tilt Poker to Get Started Now! Now that you know everything about FullTiltPoker.com, it's time to get started. Visit Full Tilt Poker and use referral code PSITEORG while creating your account to automatically receive our exclusive 100% up to $600 sign up bonus.